ruthdelacruz | Travel and Lifestyle Blog : [Ruthilicious x Cream Silk Giveaway] Where Can Your Hair Take You? [Ruthilicious x Cream Silk Giveaway] Where Can Your Hair Take You? I grew up seeing Cream Silk in our bathroom, and it was Cream Silk (and sisters) who introduced me to what hair conditioner is all about. Since then, it has become my ritual - the shower experience would not be complete without a shampoo and conditioner. Cream Silk is celebrating its 30 shining years through the new Cream Silk Stand Out Shine straight conditioner. 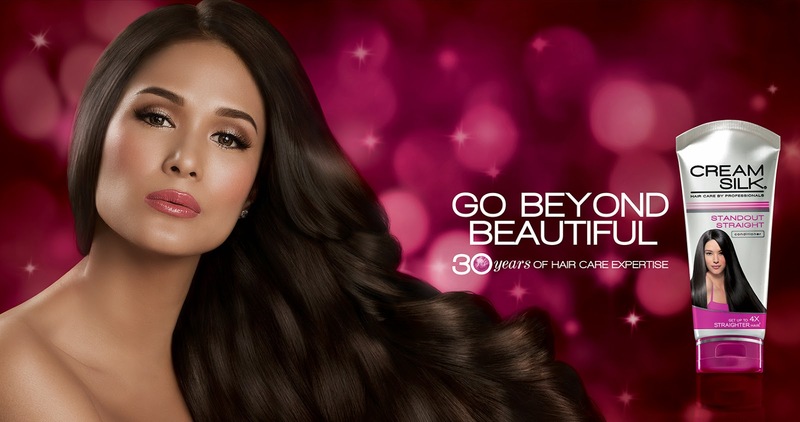 I am sure you have seen the new TVC featuring Heart Evangelista, Sam Pinto and Toni Gonzaga. Do you want to be like these ladies? Join the simple giveaway! Contest will run from today until February 23, 2014. Winners must present valid ID (and authorization letter if representative will claim the prize). Winners can claim the prize between 10 AM to 6AM from March 1 to 30 only. Join now, and be beyond beautiful! Thank you to everyone who joined the giveaway and shared their beyond beautiful moments! Congratulations to the winners of the Cream Silk Gift Packs! © ruthdelacruz | Travel and Lifestyle Blog : [Ruthilicious x Cream Silk Giveaway] Where Can Your Hair Take You?